India plans a feverish schedule of satellite launches in the second half of this year, including liftoff of the country's first robotic Mars mission and a crucial test of an indigenous rocket designed to loft large spacecraft to high-altitude orbits and deep space. If the missions launch successfully and on schedule, 2013 could be a banner year for the Indian Space Research Organization (ISRO), which has matured at a measured pace over the last few decades, debuting environmental and communications satellites and an unmanned mission to the moon. "This year is going to be one of the most important milestone years for ISRO's program," said M. Chandradathan, director of India's Liquid Propulsion Systems Center, in remarks following a successful launch in early July. "We plan to have five successful launches this year, and two launches have already gone." India has never conducted more than three space launches in a single calendar year. 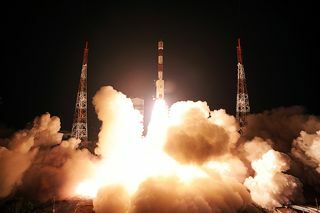 But in 2013, including satellites and rockets, India could launch up to 12 space missions before the end of December. The year began with the launch of seven satellites aboard India's PSLV, including a French-Indian ocean-research craft, a Canadian asteroid detection mission and a tiny CubeSat run by a computer borrowed from a smartphone. India completed its second launch of the year July 1, lofting the first spacecraft dedicated to the country's satellite navigation system, which seeks to improve GPS positioning coverage over India and neighboring regions. Three more satellites for the Indian Regional Navigation Satellite System (IRNSS) are being manufactured and tested for launches next year. While India's workhorse PSLV has amassed 23 straight successful launches, development of the country's more capable GSLV has hit setback after setback. Steeper challenges await Indian engineers in the second half of 2013, beginning with the next launch of the country's largest rocket, the GSLV, as soon as Aug. 6. First developed in the late 1990s to reduce India's reliance on foreign rockets, the GSLV has a troubled track record. In seven launches since 2001, it has delivered its payload to the correct orbit only twice. India purchased Russian engines to power the third stage on the first five GSLV missions, but India is trying to perfect its own third-stage engine to make the GSLV an all-Indian rocket. The Russian and Indian upper stages burn liquid hydrogen fuel stored at cryogenic temperatures. The first test flight of the Indian-built upper-stage engine, a configuration known as the GSLV Mk.2, fell short of Earth orbit in April 2010, after the cryogenic engine stopped working moments after it ignited. India launched another GSLV in December 2010 with a Russian upper-stage engine, but the rocket exploded less than a minute after liftoff. The GSLV has been grounded since then, while officials conducted a comprehensive review of the program and subjected the Indian-built upper stage to extensive testing. "We are sure that with the adjustments we have made and the meticulous reviews we have gone through, this [GSLV upper stage] should perform precisely and we'll have a very successful GSLV mission," said S. Ramakrishnan, director of India's Vikram Sarabhai Space Center, which oversees rocket developments. "We have a great challenge ahead, but I'm sure that one day GSLV will be operational and as reliable as PSLV." ISRO is putting the GSAT 14 communications satellite on the GSLV for the rocket's upcoming test flight. As workers at ISRO's launch base at Sriharikota Island on India's east coast prepare the GSLV for this next test flight, another team of Indian engineers are fueling two satellites for launch on European Ariane 5 rockets this summer. The INSAT 3D satellite, scheduled for an Ariane 5 launch July 25, will modernize India's weather satellite system. The next Ariane launch, set for late August, will loft the GSAT 7 communications satellite, intended to serve the Indian Navy. India has relied on Europe's Ariane rockets to launch its largest satellites since the 1980s, but officials hope successful test flights of the GSLV Mk.2 next month and a larger GSLV Mk.3 rocket next year will bring those satellite launches back to Indian soil. Two more PSLV launches will round out the year. India's first Mars orbiter is set for launch in late October, when it will begin a journey to Mars, set to arrive in September 2014. Reportedly costing $76 million, the robotic mission will mark India's first launch to the Red Planet, primarily serving as a test of technologies and techniques required for deep space probes. The Mars orbiter's five scientific instruments will study the Martian surface and atmosphere, map mineralogy and attempt to detect the presence and concentrations of methane. India plans another PSLV mission at the end of 2013, carrying France's Spot 7 Earth-observation satellite, an example of inroads made by ISRO's commercial sales division in marketing Indian rockets for the launch of foreign satellites. "It's going to be full of activity, and we should be able to do everything correctly," said S.K. Shivakumar, director of ISRO's satellite center, in a speech to Indian engineers. "With support from all of you, we should be able to really deliver the goods in the proper way and keep the country abreast with all these developments."